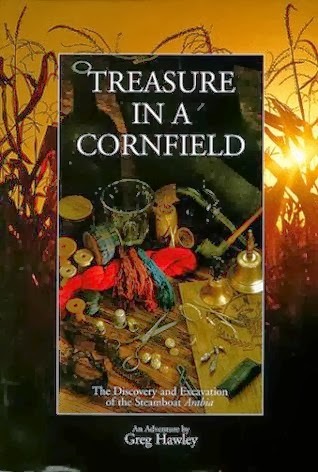 Treasure In A Cornfield: The Discovery and Excavation Of The Steamship Arabia, Greg Hawley, Paddle Wheel Publishing, 2005, 223 pp., 106 color photographs, 3 b/w photographs, 2 color illustrations, 35 color diagrams, 13 b/w diagrams, 1 color map, glossary, appendix, $23.95. The steamship Arabia was built in Brownsville, PA on the Monongahela River. It sank in 1856 during a flood on the Missouri. After sinking the deck was swept clear by the flood. The hold filled with sediment. The contents were excavated in 1998. 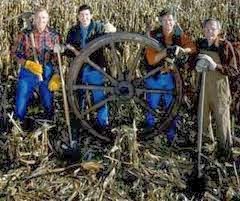 Here is the story of the finding, excavation and preservation of material goods and one skeleton from 1856. The exhibit is coming to Pittsburgh's Heinz History center during the late spring and early summer of 2014. Treasure In A Cornfield's diagrams, both black/white and color are well drawn and essential for understanding the steamship, its contents and the destruction of its deck. Color photographs of the artifacts are profuse and show the details of steam engines and the porcelain china, color and fibers of the textiles and the weapons. Those with an interest in the Civil War will find amazing illustrations of material culture of the era. Those with an interest in riverboats on the Potomac, Ohio, Mississippi, Cumberland and Tennessee rivers will easily be able to imagine how mountains of goods were moved by Federal inland navies in support of Federal armies. Those who enjoy prospecting on ground marched and camped on by the armies will be intrigued by the story of the discovery and excavation of the steamship Arabia over 150 years after its sinking. Treasure In A Cornfield: The Discovery and Excavation Of The Steamship Arabia, is written in a style that is accessible to general readers;there is a glossary of terms for use by landlubbers. The steamship's museum is in Kansas City and has a website here. Preparations are now underway for C.E. Williams, a contractor for the nonprofit Gettysburg Foundation, to remove the old Visitor Center parking lot on North Cemetery Ridge in Gettysburg National Military Park. Once the asphalt has been removed, the contractor will regrade the area to its historic profile in 1863, and plant meadow grasses. Historic fencing on the site will be built during the Gettysburg Foundation's "Friends of Gettysburg" annual volunteer day in June. Since 2009 Gettysburg NMP and the Gettysburg Foundation have been returning key portions of the center of the Union battle line on North Cemetery Ridge to their appearance at the time of the Battle of Gettysburg, 1863. Completed phases include the demolition of the old visitor center in 2009; planting 41 apple trees to reestablish the Frey orchard (North) in 2010; and demolition of the Cyclorama building in 2013. "These rehabilitation projects allow us to place more and more puzzle pieces together on the battlefield. They improve integrity of the battlefield landscapes and improve our visitors' understating of what happened at Gettysburg and why it's so important," said Zach Bolitho Acting Superintendent, Gettysburg NMP. Through the generosity of donors, the Gettysburg Foundation is funding this phase of the project by covering the cost of general contracting, construction management and design costs which total approximately $400,000. 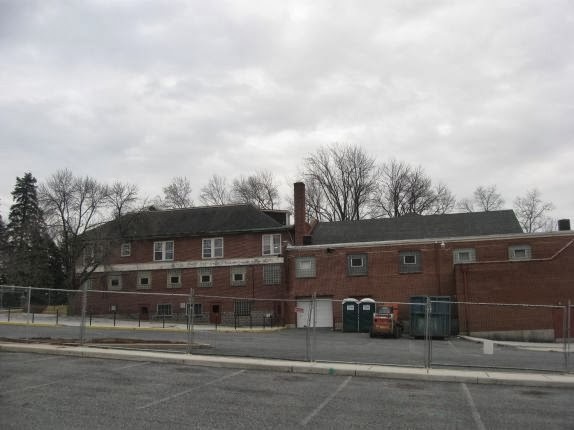 The Foundation also funded the cost of last year's demolition of the Cyclorama building which was $750,000. Joanne M. Hanley, Gettysburg Foundation President, states, "The Cemetery Hill and Cemetery Ridge areas are central in Gettysburg National Military Park's and the Gettysburg Foundation's efforts to educate millions of visitors about the battle of Gettysburg, the causes and consequences of the American Civil War, and the lasting significance of this critical time in our nation's history. Preservation of this site will forever enhance the interpretive value of this critical portion of the Gettysburg battlefield." The current phase of the project will begin in February and take approximately two to three months for completion depending on the weather.The National Cemetery South parking lot, which used to be known as the Cyclorama parking lot will be retained for visitor use. Some modifications to this lot are planned in a future phase of this project. Additional future phases of the rehabilitation of Cemetery Ridge include reconstructing a commemorative era pathway and moving five monuments to their historic locations. These features were altered during the construction of the Cyclorama building in the early 1960s. Gettysburg National Military Park is a unit of the National Park System that preserves and protects the resources associated with the Battle of Gettysburg and the Soldiers' National Cemetery, and provides an understanding of the events that occurred there within the context of American History. Information is available at www.nps.gov/gett<http://www.nps.gov/gett_>. The Gettysburg Foundation is a private, non-profit educational organization working in partnership with the National Park Service to enhance preservation and understanding of the heritage and lasting significance of Gettysburg. The Foundation raised funds for and now operates the Museum and Visitor Center at Gettysburg National Military Park, which opened in April 2008. In addition to operating the Museum and Visitor Center, the Foundation has a broad preservation mission that includes land, monument and artifact preservation and battlefield rehabilitation-all in support of the National Park Service's goals at Gettysburg. Information is available at www.gettysburgfoundation.org<http://www.gettysburgfoundation.org/>. 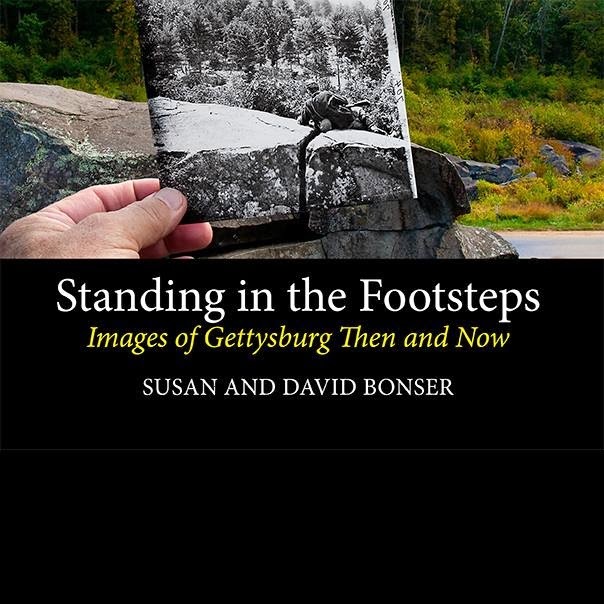 Standing In The Footsteps: Images of Gettysburg Then and Now, Susan and David Bonser, CreateSpace Publishing, 55 pp, 21 images, 1 map, $7.95. Standing in the Footsteps is a collection of 'then and now' photos using images from the archives of the Gettysburg National Military Park photographed today in the same Gettysburg locations in which they were originally taken. There have been nearly countless times when I been walking Gettysburg Battlefield, books with photographs in hand and trying to find the spot shown in the picture that was taken 150 years ago. Using twenty-one photographs, taken between1866 and 1978, Susan and David Bonser have uniquely captured what visitors to the Gettysburg National Military Park likely imagine. Soldiers and veterans of the battle are still in the park. "On great fields something stays," Joshua Chamberlain said. The Bonsers have found, to a degree, what has stayed. Instead of old images on the left page and new images on the right page. The Bonsers have inlaid the old black and white photograph inside the contemporary photograph. Yes, the Bonsers' fingers are in the modern photograph and holding the black and white photograph. The presence of the thumb and fingers add the presence in the picture of the reader who may be far away from the battlefield park. The famous photographs of the dead men or horses are used. The earliest photograph is from 1866 with a soldier at Devil's Den; the latest photograph contains President Jimmy Carter, his wife Rosalyn and Prime Minister of Israel Menachem Begin in the Soldiers' national Cemetery. Monument erections and dedications, Sickles at the Trostle Barn, Chamberlain and soldiers at the 20th Maine monument, veterans shaking hands at The Angle, and many more are featured. Standing In The Footsteps: Images of Gettysburg Then and Now delights visitors to Gettysburg while they are at home. 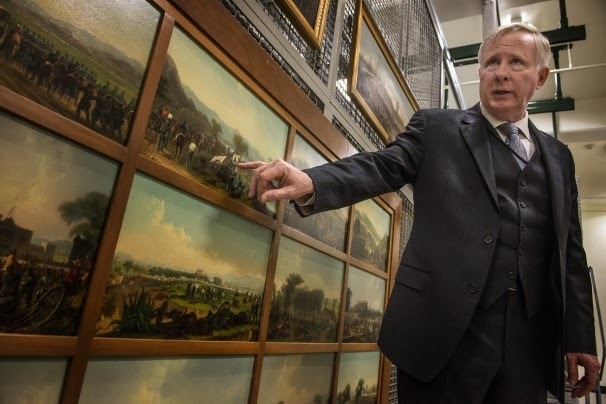 Trove Of Army’s Art Awaits A New Museum: Four Rockwells Top A List Of 16,000 Pieces, Michael E. Ruane, Washington Post, January 15, 2014. Meanwhile, the art collection and a trove of other Army historical treasures wait in climate-controlled seclusion. The collection is superb. It has four original works by Rockwell, and several by the noted World War II illustrator Tom Lea — including his famous portrait of a stunned, battle-fatigued Marine, entitled "Marines Cal It That 2,000 Yard Stare." There’s art by Floyd MacMillan Davis, the magazine and advertising illustrator, and by Edward Reep, on the ground, painted the World War II bombing of Italy’s Monte Cassion while it was still underway. “The earth trembled (and so did my hand),” Reep said later. . . . .
There’s a series of elegant 1840s paintings from the Mexican War by James Walker portraits of Civil War Gen. Philip Sheridan and President Abraham Lincoln, and stark, impressionist works from the Vietnam War. In all, there are 16,000 pieces of art stored in the Army’s $24 million Museum Support Center, which was created to care for items destined for the museum. Although American martial art became well known during the Civil War, with such painters as Winslow Home and Conrad Wise Chapman, and illustrators like Alfred Waud, the official War Department art program began in World War I, Forgey said. . . . . The American Civil War Museum has been chosen as the name for the newly combined museum of the Confederacy and the American Civil War Center. The simple name rose to the top in testing of both traditional and nontraditional names for the new entity, said Waite Rawls, co-CEO of the new museum. “The very strong consensus from all over, from heritage groups who knew us really well to people who barely ever heard of us, was, ‘Don’t mess around. Tell us what it is’,” Rawls said. The title was presented to the museum’s executive committee on Dec. 19 and was adopted by the full board Jan. 3. The American Civil War Museum will be headquartered on the historic site of the Tredegar Iron Works in Richmond, where its leaders plan to construct a new museum building to combine the best aspects of The Museum of the Confederacy and the American Civil War Center. The goal of The American Civil War Museum is to help a diverse national and international audience learn American Civil War history in all its breadth and scope, according to the announcement of the new name. Using dynamic and interactive exhibits, engaging educational programs and historical research, the museum will tell a multitude of military, political and civilian stories of the people of the time. It will also ensure and strengthen the preservation of an unparalleled collection of Civil War artifacts. From late October through December, museum leaders conducted market research to gather public input on the new institution and its name. This research included telephone and focus group interviews, and email surveys. Participants in the market study ranged from people representing heritage groups and Civil War roundtables, to museum supporters and members of the general public. 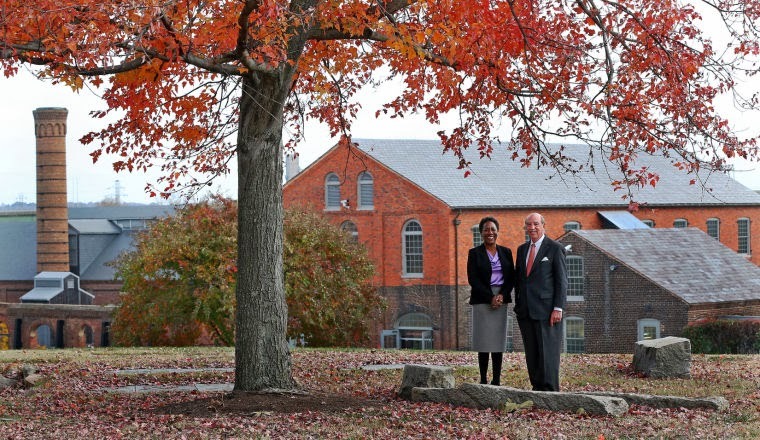 Photo Caption: Christy Coleman (left) of the American Civil War Center and Waite Rawls of the Museum of the Confederacy, near the museum buildings at Tredegar on Nov. 15, 2013 when The American Civil War Center and the Museum of the Confederacy announced that they will increase their collaboration. CWL—Civil War Librarian, Rea Andrew Redd, Director, Eberly Library, and adjunct instructor, U.S. history, Waynesburg University, Waynesburg, PA 15370; author of Gettysburg Campaign Study Guide, Volume One, . CWL: 11 On page 60, the text reads “Longstreet peevishly rejoins, no. Lee told us to attack up the road, we attack up the road. Longstreet is torn. There’s no one way he feels.” What tone are you setting for the reader? DD: Good question. I was trying to mimetically not only overtly describe Longstreet’s dilemma but convey the mood of what I think at that moment was his frustration, loyalty, pessimism, anger, stubbornness, loyalty (again) and fatalism, each at war with the other(s). CWL: 12. The review in Library Journal stated: “A dispassionate recitation will suddenly veer into purple prose (e.g., “Near the darkling swale of Plum Run, Barksdale is discovered….”), complete with mixed metaphors (e.g., “Like a mighty breaker exhausting to froth, the Confederate sweep eastward has run out of steam”).” As authors, how do you approach statements like these? DD: I am responsible for the outbreaks of purple prose, from more than which you will find in the book David Reisch saved me. I don’t apologize, but I do, certainly, admit that what I write sometimes (I trust not often) goes too far, becomes contrived or, worse, cute or, worst of all, opaque in a sophomoric attempt to be colorful. Yet, you can’t write well if you edit yourself while you’re writing, so, what I hope I can learn to do (better) is to flag and temper or eradicate the purple prose when it rears up. But who’s counting? I am (!) Of perhaps four dozen written review/responses, from here and there, to the book, about half a dozen expressly make it clear they do not like the writing. Not quite double that go out of their way to praise the writing. And the great majority (I with unobjective egoism calculate), in praising the book highly, generally and without caveat are in effect approving of the writing. But! The purple prose criticism is not only valid but, much as I hate to admit it, accurate. CWL: 13. Stackpole Publishing has been around since before World War 2. Tell us a little about the history of Stackpole Books and Edward Stackpole. DD: We – my family – have been publishing for 120-plus years – newspaper, the odd book in the early twentieth century. In the mid-1930s my grandfather Edward Stackpole and his brother formalized the tiny book publishing vein as “Stackpole Sons.” He, my granddad, his father before him, a bit, my dad, and I all worked in the field (of publishing). My grandfather Edward Stackpole, a friend, I’m fortunate to be able to say, was a general, was awarded everything, and I mean everything, short of the Medal of Honor for his service in World War I, published, wrote, was heavy into community affairs, a charming man, what they sometimes call a mensch. CWL: 14. Stackpole Publishing offers Don Troiani’s books. Is it an exacting business to publish art books? DD: Very exacting to publish art books, which we don’t strictly speaking do . . . Jack Davis suggested we see if Don Troiani (head and shoulders, in my opinion, the best Civil War painter and one of the very few best “war” painters anywhere ever), would let us do a book, with text (Jack and the late Brian Pohanka), of his magnificent paintings. He did, we did, and the huge success continues. We’re proud to have more than one Don Troiani book on our list. He is the very best and, naturally, though I believe he’s pleased overall with what we’ve been able to do together, momentary issues such as the exact blue of a particular sky have, once or twice, led to what the diplomats call a frank and open exchange. We are, again, immensely fortunate he chose us. DR: Exacting – and very much worth it. Don’s paintings involve not only days upon days at the canvas, but also countless hours devoted to researching the historical details, acquiring period uniforms and equipment, and enlisting individuals to pose. He takes the time to get every detail right, from the shade of blue of a Union jacket to the position of a metal ring on a musket, and we’re happy to take the time to make sure Don’s artistic talent and historical meticulousness come through in the printed books. The results, we hope, speak for themselves. CWL: 15. Stackpole Publishing offers Ralph Peter’s fiction written under the pseudonym of Owen Parry. How did this come about? DD: Ralph is a friend, and a friend of the house, and, as with Don Troiani, we’re hugely proud to have books of Ralph’s on our list. Principally, as we are, principally, a nonfiction publisher, we have done collections of Ralph’s well-known non-fiction writing, commentary, on geo-military-political affairs and history. These books have been a source of pride for us not to mention lucrative. We also have a few re-issues of Ralph’s best-selling Civil War novels (nom de plume Parry). We haven’t had a book of his in a while as he’s doing more Civil War novels, one of which to me – Cain at Gettysburg – is on the short list of the best Civil War fiction. CWL: 16 What will Stackpole Publishing release within the next two years regarding the American Civil War? DD: Classified I’m afraid. Thanks so much for the forum and the good questions, it was fun. CWL: Thank upu for Gettysburg: The Story of the Battle With Maps and for this interview. CWL: 6. Can you describe the process of preparing the atlas for publication? What stumbling blocks were there? DD: Stumbling blocks: in a word, the ever difficult, torturous, essential decision, demanding to be made again and again and again, of what to leave out. Also, to strive (didn’t often succeed, but tried) to make all clear. Text. Maps. People are starving for clear expression. DR: It was an intense and intensive process of writing, mapmaking, discussing, revising, with research done, and done again, every step of the way. It involved not only the two of us and stacks of books, reams of paper, but also a team of creative, hardworking folks who took the text and hand-drawn pencil maps and turned them into the eye-pleasing pages you see in the book. CWL: 7. What did you discover that surprised and when you knew you were done? DD: That I wasn’t sad. CWL: 8. On the left page "clips" of the map on the right page are presented. This appears to be a novel approach. How did this concept develop? DD: Good question. Though we held the concept of never changing the “stage” of the base map, it does, in fact, illuminate and edify to blow up a sector, to show complicated action there, so we developed what we call “margin” art, or little clips, as you excellently describe it, to enlarge, even mark up a bit, and run in the margin of the base-map-facing text page, beside the relevant text. Also, in the margin art you can graphically, i.e. nonverbally, “say” (show) what might have been, what was intended, what was prevented, so on. CWL: 9. Time on the battle clock is always debatable. Noah Trudeau’s A Testing Of Courage has clocks with hour and minute hands on each map. Gettysburg: The Story of the Battle With Maps uses terms such as ‘midday’ , ‘late afternoon’ and ‘twilight’ to designate time. DD: Right . . . we worked hard to get the events described/portrayed in the order in which they happened. To get (approximate) contiguity and contemporaneousness . . . but as to what 15-minute time field anything happened in, it’s far rarer to find agreement than diverse variation, among the many excellent texts and map books on the battle, as to just when an event occurred. What its duration was. I found three reputable accounts of the Battle that couldn’t agree on when the sun came up! DR: Almost unbelievably to our modern atomic-clocked minds, time was a rather subjective thing 150 years ago, outside but especially inside the world of battle. Time was often guessed at by the position of the sun, those who had watches generally did not synchronize them, and combat distorted – stretched, compressed, twisted – time. One example: Most accounts agree that the artillery barrage before Pickett’s Charge began around 1 p.m. on July 3, but estimates of the barrage’s duration vary wildly, from approximately twenty minutes to five hours or more . . . which of course has implications for just when the Charge itself began. But there are enough firsthand accounts, and enough historians have analyzed and dissected those accounts, that very reasonable estimates could be made, especially within the geographic and chronologic framework we were creating – once we nailed down a couple events, another handful would fall into place. CWL: 10. The narrative is written in the present tense and future tense. How was this decision made? DD: There’s a tiny sprinkling of past tense. But you’re right, 99% is present tense. Guess I thought the past tense might become too ponderous . . . also, the book as I’ve struggled to describe (facets of) it above is, in its spirit, and letter, virtually always in the present moment. Other (better) books must (nevertheless) flash back, use the pluperfect, and in their structure as well as tense stutter around, back, forward, in their sections, in time. DR: The present tense was a natural fit for a book like this, which describes and illustrates the battle as it unfolded – er, unfolds. Hopefully it conveys a sense of immediacy and contingency – a sense that the battle is happening right here, right now, and could, at any number of decision points, have turned out somewhat differently. The present tense isn’t appropriate for every work of history, and it has its limitations, but to my mind it’s not deployed as often as it might be, particularly in military history. Castel’s Decision in the West is an outstanding example of the possibilities for the present tense in historical writing. CWL: 1. Tell us a bit about yourself regarding and how you came to be editors for Stackpole Press? DD: STACKPOLE is a family-owned small business and I the fourth generation. We do excellent books, I think. Have been running it for 38 years; if survival’s success, am succeeding. DR: It was my good fortune that Stackpole was hiring just as I left college with a degree in history and a love for the written word. I’m still here more than ten years later. CWL: 2. As editors, what tasks to you regularly do? DD: I am an editor at heart, despite title, and an editor finds superb authors and helps them develop a book better even than they could have imagined. DR: Editors, especially at a smaller publisher like Stackpole, perform a variety of tasks, from the acquisition and development of new books to the copyediting and proofreading of those books, as well as marketing and promotion work. Turns out we can also be called upon, happily, to be historians as well. CWL: 3. 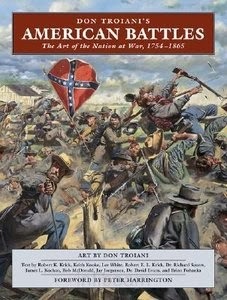 What got you interested in the study of history and the Civil War period? Are other periods of history as important to you as the American Civil War? DR: My interest in history began, when I was a boy of eight or nine, with an interest in the Civil War, which in turn began with books, such as the old classic kids’ novel Rifles for Watie. Soon I moved on to Civil War Times magazine and adult history books. Among the first of those I ever read was General Stackpole’s They Met at Gettysburg. I was hooked, on Gettysburg, on the Civil War, on history. It didn’t hurt that I grew up half an hour from the battlefield, had parents who encouraged my interests, and had some wonderful and inventive history teachers, not only in college, but also in middle and high school. I often venture into other areas of history, World War II especially, but without fail I come back to the American Civil War. Fortunately for publishers, not to mention historians, there seems always to be something new to learn, new to say, about this inspiring, appalling war of better angels and killer angels. CWL: 4. Within the recent past, several Gettysburg Campaign atlases have been published. Why another atlas on Gettysburg? DD: I conceived of a treatment of the Battle of Gettysburg which would map, every other page, the progress of the battle without changing the grid, the size, the dimensions, the area, of the map. Books previously – excellent ones – without fail took advantage of space to, when half the battlefield contains no event, leave it visually out. Our GETTYSBURG shows the flow of the battle by keeping the stage – the base map – constant. Other books zoom in, focus on an important area, fine. But our original treatment shows something that a “moving camera” cannot: the flow, the progress, of the facets of the battle as interrelated in time and space constant, over the 3 days. Years ago when they made a film of the ballet Romeo and Juliet (Prokofiev’s I think), it drove me crazy when the movie camera moved – with Nureyev as he leaps -- or Fonteyn as she pirouettes along. Ballet’s to been seen danced, its flow, on the unmoving base map of the stage. CWL: 5. What makes your study stand out? What does it contribute to the literature that has not already been contributed by others? DR: We’re lucky to have some very good maps of the battle. But as useful as those other maps are, the picture they give can sometimes be disjointed or at least incomplete. It’s essential to zoom in on, say, the Wheatfield in order to understand that bloodily tangled area of the battlefield. But our book zooms out to show not only what was happening in the Wheatfield, but also what was happening elsewhere on the field at the same time – the fighting taking place in other sectors, the movement of reinforcements, and so on – so that the importance of the Wheatfield becomes clear (e.g., why it was the scene of such desperate fighting, what the Confederates could have done if they decisively seized it, how Union reinforcements of the Wheatfield sector weakened other parts of Meade’s line) and so that the tactical decisions of Lee, Meade, and their lieutenants can be more easily understood. 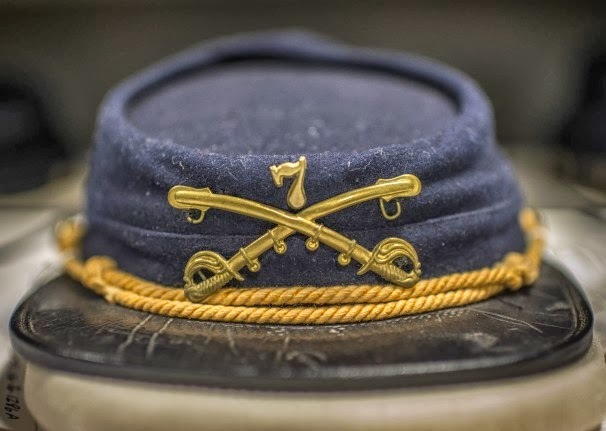 We’ve aimed to depict – shifting now from dance to music – not movements or isolated bars of melody, not cellos or trumpets alone, but the entire grand symphony that was the Battle of Gettysburg.